The purpose of the Common Reporting Standard Implementation Handbook is to assist government officials in the implementation of the Standard for the Automatic Exchange of Financial Account Information in Tax Matters and to provide a practical overview of the Standard to both the financial sector and the public at-large. The Handbook provides an overview of the legislative, technical and operational issues and a more detailed discussion of the key definitions and procedures contained in the Standard for the Automatic Exchange of Financial Account Information in Tax Matters ("Standard"). 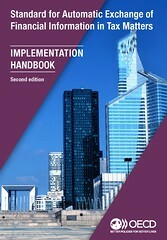 Changes reflected in this second edition of the Handbook provide additional and more up-to-date guidance on certain areas related to the effective implementation of the Standard. This includes revisions to sections pertinent to the legal framework for implementation of the AEOI, data protection, IT and administrative infrastructures as well as compliance measures. More clarity has been provided in the trust section of the Handbook relation to the identification of Controlling Persons. This edition also includes all Frequently-Asked Questions in relation to the Common Reporting Standard that have so far been issued by the OECD. These FAQs are intended as a "living document" and regularly updated.